Beautiful Incentives: Drawer Decor Giveaway! Loving Life and Living on Less has a fun giveaway going on sponsored by Drawer Decor! Drawer Decor is one of those products that is an absolute necessity to keep kitchen drawers clean and organized. They come in Red, Orange, Lime, Iris and Sky Blue and the starter kit is perfect to begin getting a hold of the mess in your kitchen utensil drawer. 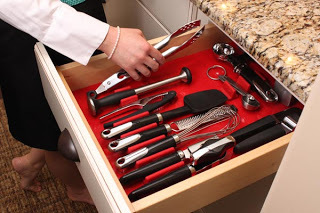 The starter kit is 16 pieces and Drawer Decor is fully customizable to fit any drawer. Check out the full review on LLandLoL's site. Giveaway runs 11/26-12/9. Enter Below to win your own Drawer Decor or New Acrylic Utensil Organizer (Winner's Choice)- US Only. Good Luck! http://www.beautiful-incentives.com/ did not recieve financial compensation for this post and is not responsible for prize fulfillment.